This is the volume where things start changing in a big way, and its crucial episode supposedly happened as a near-accident. If you believe this Alan Grant interview--which I'm not entirely sure I do--the story planned for Prog 460 was originally going to be called "Letter from a Baffin Island Nudist" until that premise was rejected; Grant and John Wagner rummaged about for a moment to figure out who a letter could be from, and came up with "Letter from a Democrat." 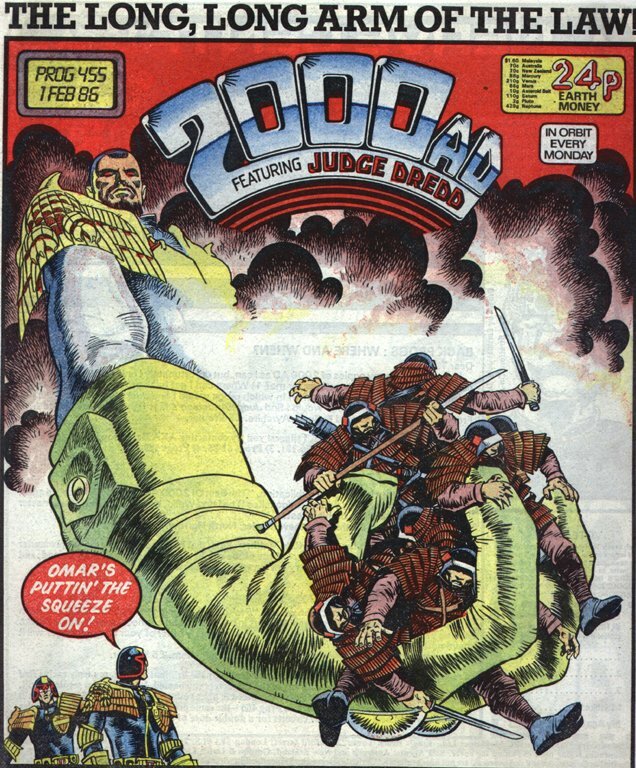 For those of you who haven't read it, the result was a 7-page story narrated by a mother of two small children, who forces Dredd to kill her so she can be a martyr for the pro-democracy movement. It might be the biggest pivot point of the whole series. Dredd had been a fascist from the get-go, and Wagner and Grant had always made great sport of having him stomp on various basic rights. They'd been pushing that point pretty hard over the previous few months--"The Man Who Knew Too Much," in particular, is a harsher "yes, the Judges are doing terrible things to maintain their power; no doing anything about it" story than they'd published before. But after Hester Hyman's sign-off ("what kind of mother could stand by and see her babies grow up into frightened, beaten people like us? "), it got a lot harder to show Dredd as a hero, or even an antihero, or as anything other than as the willing champion of a despicable system. Dredd stories tend to end with some kind of comedic or ironic flourish; the last thing in this one that can pass for an (ice-cold) joke in this one is Dredd's admonition to the husband of the woman he's just killed: "Let this be a lesson to you... Democracy's not for the people." Which reminds me: have we seen Simson Hyman or Gort Hyman Jr. at all in the past 20 years or so? 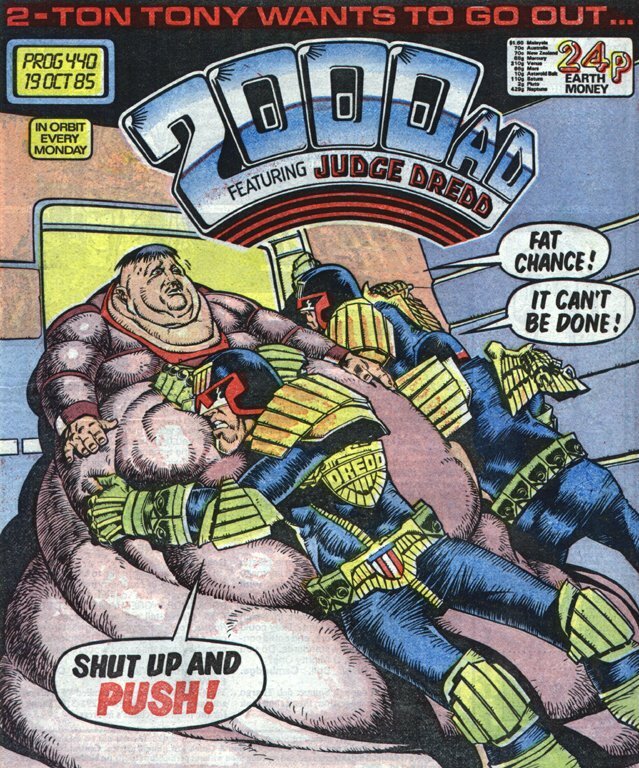 In retrospect, "Letter from a Democrat" was a terribly risky move; it's so powerful, and shows Dredd in such a revealing and unflattering light, that it could have torpedoed the series. Instead, as we'll see over the next few volumes, it blew the doors open: it established that Mega-City One's political grounding could change--and would have to change very slowly. (The panel in which the at-home viewers are getting bored of the Democratic Tendency's demands and one of them yells at another to change the channel foreshadows the "referendum" storyline of a few years later.) 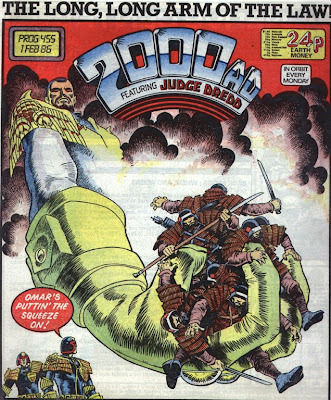 And establishing a second frame of reference for understanding the Judge system, as a horrible jackbooted force of oppression, within the story (instead of just letting readers in on the joke), opened up some rich story possibilities. 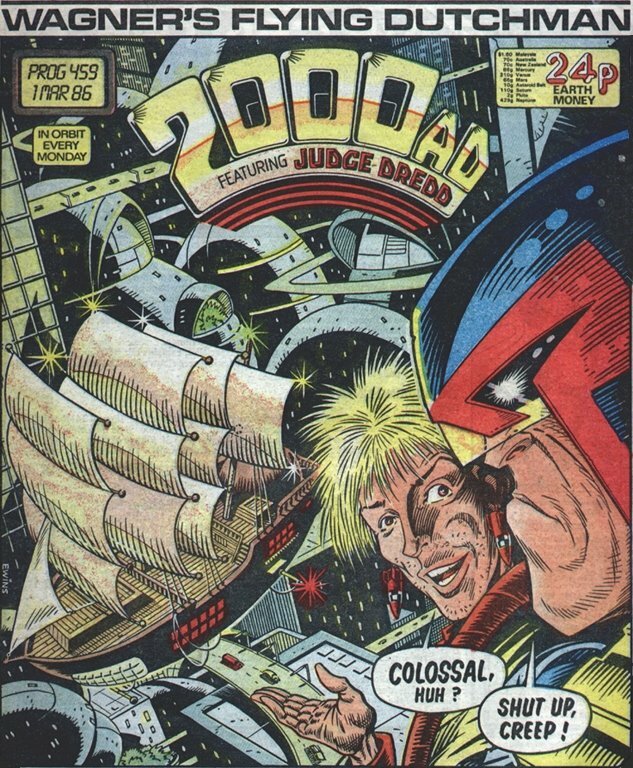 It led directly to other memorable sequences, but it also made possible every story we've seen in the past 25 years about how Dredd, and the Judges in general, might be terribly wrong. 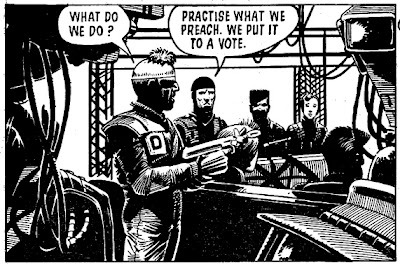 "Letter from a Democrat" isn't John Higgins' finest Dredd work by a long shot, but I'd say that it's the peak moment of Alan Grant's influence on the strip. Grant notes in the interview mentioned above that his own ideas about politics came out in Anarky rather than Dredd, but his conception of Dredd is that he's an irredeemable, inhuman terror, which is the role he plays here. Wagner's Dredd, conversely, is not quite inhuman: he's just so far out of touch with his human and compassionate impulses that on the rare occasions he has them he doesn't understand them for what they are. He's capable of skirting or ignoring the law, or even wanting to change it, in his own self-interest, but he's incapable of understanding that he has a self-interest, so when he does the right thing it's usually for the wrong reasons. Something about that really gets to me: they're not just willing to die for their principles, they actually live by those principles. The other particularly great sequence in this volume is its opener, "The Midnight Surfer"--the second Chopper story, building on a throwaway "sky-surfing" gag from a Daily Star strip. (There'd been a "Norrin Radd" joke in another episode, though; wish I could remember which one.) 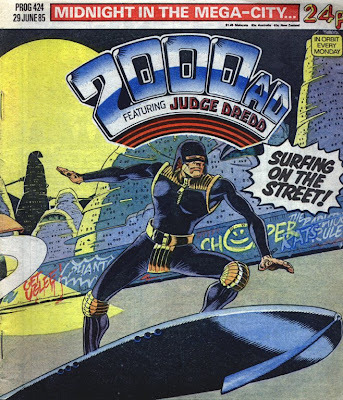 The Supersurf competition is a clever variation on 2000 AD's extreme-sports formula--a thrilling idea with a terrific visual component, pushed far enough that there's the constant threat of bloodshed. 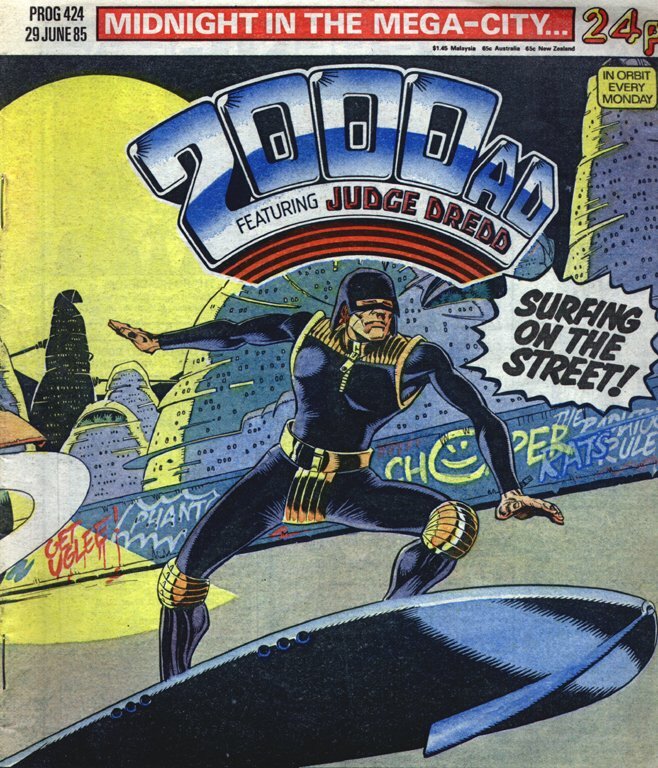 This is also the story where Chopper's role as one of Dredd's great adversaries is solidified, and surfing is a much better visual metaphor than tagging for the position he occupies: a thrill-seeker who simply doesn't care about what Grant (in that interview again) calls "enforced authority--which is what democracy comes down to in the end, as well." He looks out for himself, he looks out for his friends, and it doesn't bother him at all that his hotdogging can be a public menace. "The Midnight Surfer" rockets along for almost its entire length, but there are a lot of smart little reversals and loop-de-loops built into it: the end of the first episode revealing that the surfer is Chopper, although we've already seen his face on the first page; the comment that the young-perp rehab program has a 91% recidivism rate; the image of Dredd from Chopper's upside-down P.O.V. ; the gag that Chopper doesn't think Dredd is onto him, not realizing that he's more concerned with stopping Supersurf. 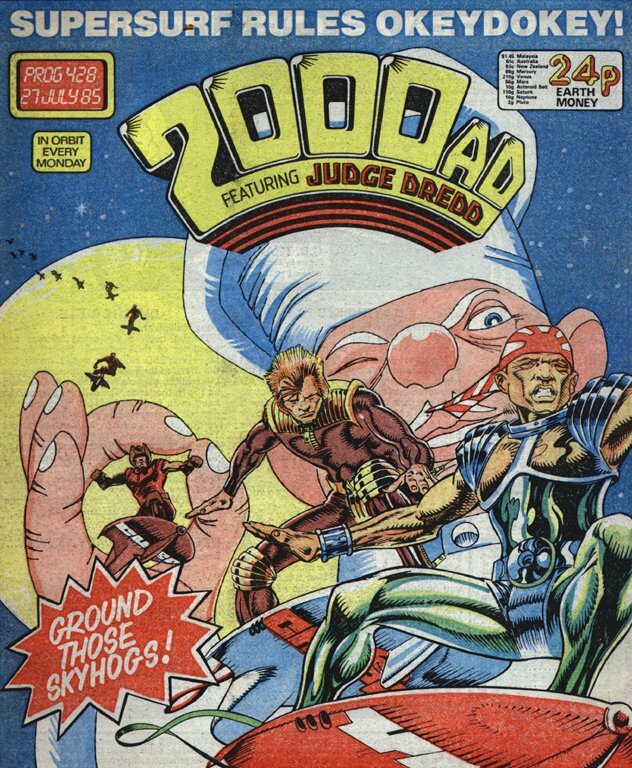 And what a brilliant ending: Chopper being led away to the cubes while everyone cheers his name is one of my favorite Dredd moments of that era. Wagner and Grant apparently really liked working with Kennedy, too, viz. the later "Kenny Who?" sequence and their yearlong collaboration with him on Outcasts for DC. One particular quirk of Kennedy's work: he seems to really like drawing costumes that obscure characters' faces. Obviously that works for Dredd, but Flip Marlowe in "The Big Sleep" never gets much of a chance to seem human. Anyway. Having gone all-out on "The Midnight Surfer," Grant and Wagner immediately retreated to older, sort-of-reliable formulas: Dredd vs. the monster who takes advantage of people's farcical politeness ("Nosferatu"), a rhyming musical parody ("West Side Rumble"), an Otto Sump routine ("Get Smart"), defective robots ("Something Abnormal About Norman"), the Fatties ("The Magnificent Obsession"). The last of those is at least a welcome variation on the formula--for once, the fat-guy protagonist's story doesn't end in tragedy, and his kid's line about "you can eat me if it'll do any good, dad" doesn't foreshadow something awful. The throwaway line at the beginning of "The Magnificent Obsession" about how the post-Apocalypse War food shortages are over now puts that era of the series to rest, too. The one-offs that occupy most of this volume sink or swim on the strength of their artists. Ron Smith, who'd been such a big part of the weekly Dredd team for the past few years (and was still drawing the Daily Star strip), was phoning it in for most of his episodes in this volume, and after "The Lurker" he all but disappeared from Dredd's 2000 AD series for eight years or so. 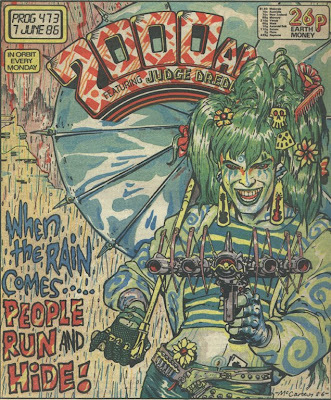 On the other hand, even though "Riders on the Storm" isn't a terribly compelling concept, it looks ravishing (especially that cover): Brendan McCarthy and "Riot" (Tony Wright) could make anything look like... a Brendan McCarthy story. Too bad these early Case Files volumes have black-and-white reproduction of their color pages. 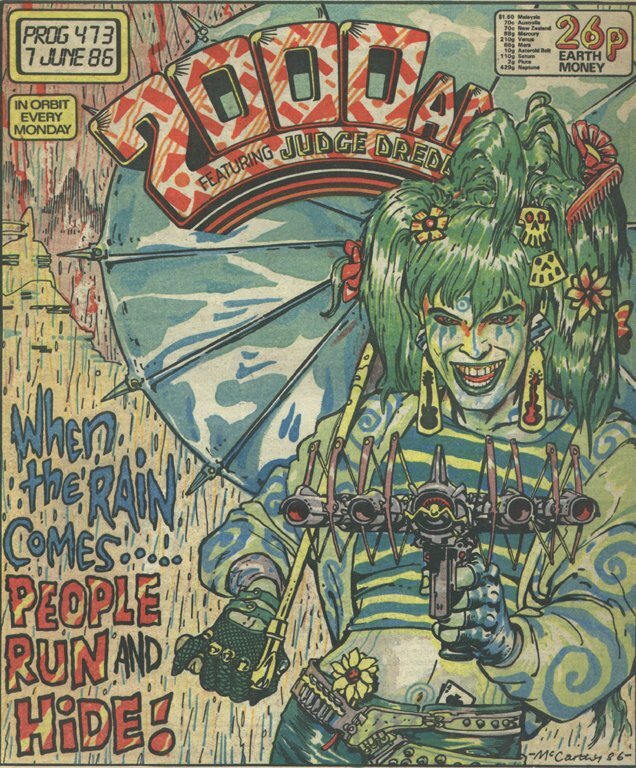 2000 AD had always been fan-response-driven, and fans obviously wanted to see their favorite characters again and again; the problem was that some of them could get badly overexposed. The prime exhibit of that here is "A Merry Tale of the Christmas Angel." It's a solidly constructed little one-off that still has to scrape the barrel to get Mean Machine back on stage, and once he's there, there's simply not much to do with him. He's totally safe! But then he gets reminded of how much he hates Dredd! And then he goes into a headbutting frenzy! We'd seen that routine before; after this episode, it'd take Wagner more than five years to figure out how to bring back Mean again without repeating it. 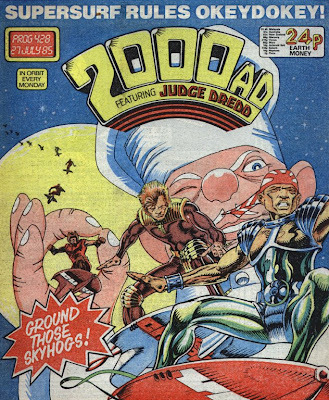 If the writing seems a little unfocused in the later stories in this volume, that may be because this was the period when Wagner and Grant were, between them, writing almost the entirety of 2000 AD--in addition to Dredd's weekly episode, the weekly Daily Star strip and its daily companion (which had launched at the beginning of 1986), they were writing the Judge Anderson series and Ace Trucking Co., and Grant was writing Strontium Dog and Bad City Blue. There were a few issues where the only non-Grant/Wagner strip was a single page of "Sooner or Later." The "Warlord"/"Seven Samurai" sequence, in particular, drags on a bit (and the Japanese stereotypes get old really fast), although it does do the service of dispatching the ultra-dull Judge Omar, and setting up the (first) resignation of McGruder... after an unrelated story the following week. (Oh, deadlines.) "A Chief Judge Resigns," on the other hand, is a thrilling little piece, especially considering that it has no action sequences at all, is entirely about internal politics, and introduces a new character (Silver) while announcing rather than showing how important he is. Its cleverest beat is McGruder firing the council members who were loyal to her on the grounds that that showed poor judgement--she comes off as the hardass to end all hardasses. Curious that she doesn't appoint anybody from Psi-Division to the new council, too: were Grant and Wagner trying to distance the Dredd and Anderson series? They weren't distancing them much--Corey shows up a few months later in "The Exploding Man." 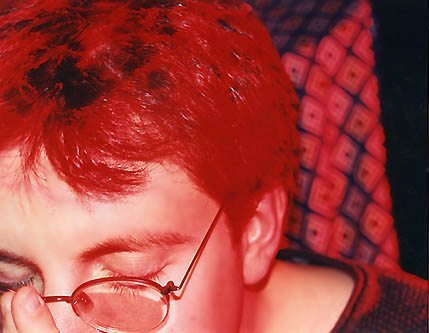 Finally, "The Secret Diary of Adrian Cockroach" isn't as funny as it ought to be, and contemporary readers--especially Americans--might not catch that it's a parody of the then-popular Sue Townsend novel The Secret Diary of Adrian Mole. (Pandrop's name is a reference to Adrian's girlfriend Pandora.) But Grant and Wagner would take another, much more successful crack at an Adrian Mole parody a year and a half later, with "Bug" and P.J. Maybe. Next week: Case Files 10, with "Atlantis," the first Taxidermist story, and more! I know this is a bit late, but yes, Hymen's children do show up during the vote on democracy storyline(I think. It was definatly one of the democracy storylines. It *might've* been the one about the demonstration.) Judge Dredd threaten to take them into the judge program to get her husband to denounce the democrats. Yeah, I just checked, and they show up again volume 11, during the Democracy rally, in second Revolution chapter. Ah, but I was asking about "the past 20 years or so"--after the "democracy" storylines in vol. 11! They'd be old enough to be more active political symbols now. Assuming they survived everything that's happened since then. 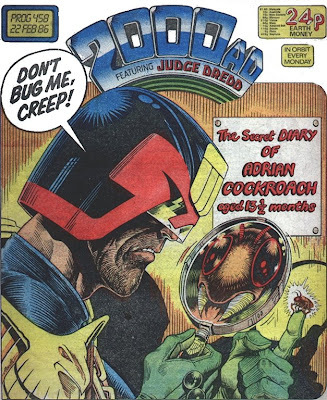 I really love your blog, after watching "Dredd" and discovering Dredd Reckoning on the first page of Google hits, your reviews of the Complete Case Files got me salivating to discover the world of Dredd comics, which I've absolutely fallen in love with. I even started reading them sequentially, and it didn't deter me a bit - the first stories from 1977 are terrific, then they just get better and better. I was eagerly anticipating the skysurfing story, especially since "Un-American Graffiti" was so good, and was kind of shocked to find myself completely on Dredd's side with this one once the media mentions a death toll of 95 - and there's only 70-something surfers. It's one thing if the they want to risk their own necks in a race - that's an issue of personal freedom - but unwitting Mega-Citizens are getting mowed down too? Exactly how does this make them any better than the psychos of "The Mega-City 5000"? Wagner made his points well in the graffiti story, especially when Chopper finds out that his rival scrawler is a robot ("Is that all we are?") but I think Judges had every right to shut down the skysurfers. It's not like they're the democracy terrorists, where you can argue that the civilian collateral damage has a greater purpose. That's one of the best aspects of the series, though - making you examine your own sense of right and wrong, and the justice or non-justice of the law. I'm just kind of disturbed by that little detail, mentioned once in passing (but never shown) and then swept under the rug in appreciation of Chopper's rebelliousness. For me it was a bridge too far. Anyways, love the blog, love Dredd, keep up the great work! It's been a while since I've read Midnight Surfer (by which I mean I haven't read it since it was first published) so I don't recall much about the details. But were the other people who died unrelated bystanders, or spectators of the actual race? If it's the latter then you could argue that they made their choice, just like the surfers did. And were they killed by surfers themselves, or collateral damage of the Judges' efforts to take out the surfers? As I said, I don't recall the details too much. But those might be questions worth considering. The Warlord: 'Bullet for you, Tojo!'.. sigh, John Wagner, Sigh. Re-reading this volume after so many years I'm knocked out with just how elegantly Alan Grant infuses his strips with humour. In The Warlord storyline, the place in which the Seven Samurai are brought to life is Cyril Lord block, now in ruins. Lord was a high profile carpet salesman in the UK who had died the year previously. In the midst of the fierce fighting when McGruder is facing catastrophe and has just four panels before been informed of Dredd's (supposed) death she is told she can't fire on the block because it's listed. Her response "Cyril Lord is a luxury we can't afford" is a direct riff on the carpet king's jingle. It's an extraordinary emotional shift in amongst such dire circumstances, but does not distract from the pace at all. Per your passing remark about Judge Sladek, I have enjoyed the mass of revisited storylines (War Buds, Whatever Happened to Conrad Conn, Walter as Call-Me-Kenneth devotee etc) of late but feel a follow up to the Fallucci Tapes could have been beautiful. Would Yolanda have waited? What happens to Judges after Titan? Has facial surgery improved since Rico's return? Wagner and Grant should have set themselves some sort of 20 year alarm to remind them.